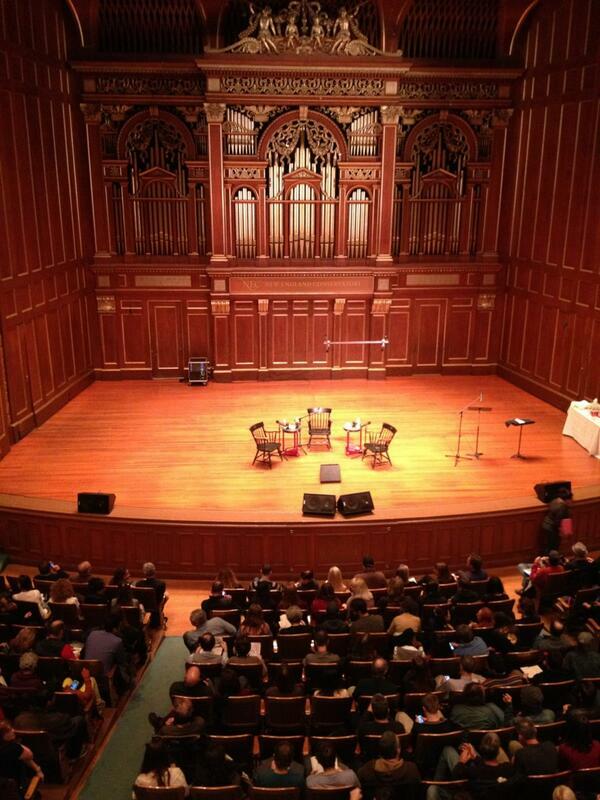 New England Conservatory welcomes legendary songwriter Elvis Costello to campus on Friday, October 25, 2013. After a morning of working in the classroom with songwriters enrolled in NEC's Contemporary Improvisation program, Costello talks about his genre-spanning career in a public forum at 2 p.m. in Jordan Hall, 30 Gainsborough Street, Boston, MA. The talk is free and open to the public. Call (617) 585-1122 or log on to necmusic.edu for more information. At the conclusion of his appearance, Costello will be awarded an honorary Doctor of Music degree from New England Conservatory. Costello, who was inducted into the Rock and Roll Hall of Fame in 2003, is the fourth Hall of Famer - following Miles Davis, Aretha Franklin and Quincy Jones - to receive an honorary degree from NEC. The son of a jazz trumpeter turned dance band vocalist, Costello cut his teeth as a performer on the folk club scene - the quintessential singer/songwriter proving ground. One of the first acts signed at the founding of the influential Stiff Records label, he began to capture attention as part of 1977's punk rock wave, which acted as a flag of convenience for a variety of musical styles and intentions. As early as 1978, Costello's appetite for a broad range of musical collaborations and adventures was expressed in a solo recording of Rodgers and Hart's "My Funny Valentine, his appearance with country/blues legend Delbert McClinton at the Lone Star Cafe; his support of Rock against Racism; and his first character role in a feature film. By 1986, Costello's restless imagination produced an unprecedented concert tour that featured the "Spectacular Spinning Songbook," which audience members spun to deliver the next song selection to be performed. The show returned to the stage in 2011 and has enjoyed five U.S. runs, appearances in Australia and Europe, as well as two comprehensive U.K. tours, the last of which culminated in a three-night engagement at the Royal Albert Hall in July 2013. Costello has continued to amass an impressive songbook, featured on his own CDs as well on those by a pantheon of legendary interpreters. He has worked with the Royal Philharmonic Orchestra, Robert Wyatt, Chet Baker, George Jones, Bob Dylan, the Count Basie Orchestra, Johnny Cash, Rosanne Cash, Kris Kristofferson, Tony Bennett, Yoko Ono, Allen Toussaint, The Pogues, Jimmy Cliff, Hal Willner's "Weird Nightmares" featuring the microtonal instruments created by Harry Partch, Mingus Big Band/Charles Mingus Orchestra, Brodsky Quartet, Gunther Schuller (who conducted Costello's first very short orchestral overture, "The Edge Of Ugly" in 1995), Hubert Sumlin, Anne Sofie von Otter, Swedish Radio Symphony, Solomon Burke, Emmylou Harris, Charlie Haden, Van Morrison, John Harle, The Fairfield Four, Marian McPartland, Bill Frisell, Diana Krall, Metropole Orkest, Lucinda Williams, Madeleine Albright, and The Roots, to name just a few. Costello's songwriting collaboration with Paul McCartney yielded a dozen songs and the same number were written with Burt Bacharach appearing on the album, "Painted From Memory", which they are currently adapting for the musical stage, along with entirely new compositions. All the while, he has continued to work with early-days musical partners Nick Lowe, Pete Thomas and Steve Nieve. The Juliet Letters, the 1992 song sequence composed with the Brodsky Quartet, was a turning point in Costello's songwriting career, as he moved toward long-form writing featuring classical or non-traditional rock instrumentation. Subsequent projects have included Purcell-inspired work for the viol consort Fretwork and countertenor Michael Chance; an orchestral score for the Italian dance troupe Aterballetto based on A Midsummer Night's Dream, later revised for a recording with the London Symphony Orchestra conducted by Michael Tilson Thomas; an unfinished work based on relationships of Hans Christian Anderson, Jenny Lind, and P.T. Barnum commissioned by the Royal Danish Opera; a chamber music score for a storybook recording of Tom Thumb; Nightspot, a score for Twyla Tharp and the Miami City Ballet for Latin dance band and chamber orchestra; and songs for an abandoned Broadway musical. In 2008, Costello made an entry in television presentation, hosting the interview and performance show "Spectacle" for the Sundance Channel; singing with his guests, Sir Elton John, Bono and The Edge, Renee Fleming, Smokey Robinson and Herbie Hancock and being heard in conversation with these and other guests from Lou Reed to President Bill Clinton. In the last decade Costello has embraced jazz as part of his ever-expanding repertoire. His 2003 Deutsche Grammophon album North topped the Billboard Traditional Jazz chart, while his 2004 album Il Sogno topped the Billboard Classical Music chart. His 2006 collaboration with Allen Toussaint, "The River In Reverse," peaked at #2 on the jazz chart and garnered a Grammy nomination for Best Pop Vocal Album. Never content to stop experimenting, Costello's latest project Wise Up Ghost (Blue Note) has him teaming up with hip-hop/funk legends The Roots. Founded in 1972 by musical visionaries Gunther Schuller and Ran Blake, New England Conservatory's Contemporary Improvisation program is "one of the most versatile in all of music education" (JazzEd). Now in its 41st year, the program trains composer/performer/ improvisers to broaden their musical palettes and develop unique voices. It is unparalleled in its structured approach to ear training and its emphasis on singing, memorization, harmonic sophistication, aesthetic integrity, and stylistic openness. Under Blake's guidance for its first twenty-six years, the program expanded its offerings under subsequent chair Allan Chase and current chair Hankus Netsky. Alumni include Don Byron, John Medeski, Jacqueline Schwab, Aoife O'Donovan and Sarah Jarosz; faculty include Carla Kihlstedt, Blake, Dominique Eade, and Anthony Coleman. "A thriving hub of musical exploration," (Jeremy Goodwin, Boston Globe), the program currently has 43 undergrad and graduate students from 14 countries. He has worked with the Royal Philharmonic Orchestra, Robert Wyatt, Chet Baker, George Jones, Bob Dylan, the Count Basie Orchestra, Johnny Cash, Rosanne Cash, Kris Kristofferson, Tony Bennett, Yoko Ono, Allen Toussaint, The Pogues, Jimmy Cliff, Hal Willner's "Weird Nightmares" featuring the microtonal instruments created by Harry Partch, Mingus Big Band/Charles Mingus Orchestra, Brodsky Quartet, Gunther Schuller (who conducted Costello's first very short orchestral overture, "The Edge Of Ugly" in 1995), Hubert Sumlin, Anne Sofie von Otter, Swedish Radio Symphony, Solomon Burke, Emmylou Harris, Charlie Haden, Van Morrison, John Harle, The Fairfield Four, Marian McPartland, Bill Frisell, Diana Krall, Metropole Orkest, Lucinda Williams, Madeleine Albright, and The Roots, to name just a few. i'll say this is naming JUST A FEW they only left out about 350-500 other names! Is anyone here planning to go to this? Sadly the link to the actual acceptance speech has long since become decoupled. Five seconds ago, Elvis Costello accepted an honorary doctorate from New England Conservatory. Amazing Spinal Tap moment as Elvis attempts to put on his doctoral robe over his hat. Elvis Costello says he wants Red Sox to win World Series because "I want the owner to buy us a new midfield"
"This is us being the E Street Band...all we need is a sax solo and a key change" Elvis on his cover of "Peace Love and Understanding"
From left: New England Conservatory President Tony Woodcock, Elvis Costello, and Hankus Netsky. My son went to this talk. Elvis said he wrote 12 new songs with Burt two weeks ago. After a morning of working in the classroom with songwriters enrolled in New England Conservatory's Contemporary Improvisation program, Elvis Costello, one of today's most respected popular artists, received an honorary doctorate from NEC President Tony Woodcock (in photo above) after being presented by Hankus Netsky, Chair of the CI program. Netsky gamely assisted the newly-minted Doctor of Musical Arts with his ceremonial hood, an archaic accessory which he received with bemused good humor. Much more up-to-the-minute was the Red Sox cap that was a "graduation" present. After the ceremony, Costello talked about his own genre-spanning career in a public forum, moderated by Boston Globe pop music critic Sarah Rodman. Elvis Costello's visit to NEC immediately preceded his November concert tour, which includes several New England stops. Costello, who was inducted into the Rock and Roll Hall of Fame in 2003, is the fourth Hall of Famer—following Miles Davis, Aretha Franklin, and Quincy Jones—to receive an honorary degree from NEC. Which takes me to Elvis! That's, Elvis Costello, one of the finest song writers of the last 40 years. He came to NEC recently to receive an Honorary Doctorate recognizing his outstanding contributions to the world of music. He was very generous with his time and spent the day with us, working with some singer/songwriters and giving a brilliant talk to a very full Jordan Hall. Here was a musician at the peak of his powers, speaking to the students in great technical and musical detail about their work and providing insights and directions. His energy and charm led the students to listen and think differently, complementing all the excellent work by the Contemporary Improvisation Department Chair, Hankus Netsky. At the song writing class there were two students who caught my ear in particular: Damon Smith an 18 year old freshman, who wrote, played piano, and sang in a work for large ensemble, two backing singers, trombone, trumpet, guitar, bass, and drums. It was a hugely ambitious project, but had great strength and confidence. His was a new, young voice, but one that Costello seemed to recognize immediately as original. And then there was Kirsten Lamb '15 playing an acoustic double bass and singing an original song. I had no idea what to expect before she played but as she picked up the instrument, a new sound and energy came into the room. This was remarkable. Just as remarkable as Yoojin playing her first performance of a classical gem and making it contemporary. The song's authenticity and creativity marked out this brilliant young musician as someone to watch, someone who can take us to new vistas and teach us to listen with very different ears. Elvis Costello heard all this too, and said with great humility and generosity that he had nothing to add. He’s been a singer, a songwriter, a talk-show host, an actor, and now Elvis Costello can add doctor to the list. The degree may be new, but Costello, who plays a sold-out show at the Wilbur Theatre on Sunday, has been rising to that challenge and writing healing prescriptions in the form of songs, in a variety of genres, for more than 35 years. After receiving his doctorate, I moderated a discussion with Costello and Hankus Netsky, chair of Contemporary Improvisation at NEC. Discussion has been edited and condensed. Sarah Rodman can be reached at srodman@globe.com. Follow her on Twitter @GlobeRodman. On a Friday afternoon, Elvis Costello spoke to an appreciative audience in Jordan Hall at New England Conservatory. That morning, he had worked in the classroom with songwriting students. He was introduced by Hankus Netsky, chair of the Contemporary Improvisation department, and Tony Woodcock, president of the Conservatory. Both speakers lauded Costello’s outstanding abilities and body of work, borrowing some phrases from his lyrics, such as “his aim is true” and “excellence will happen.” To cap the introduction, they awarded Costello an honorary Doctor of Music degree. Costello appeared delighted at receiving the honor, and he kept around his neck the peach-colored ceremonial hood, slightly skewed to resemble a kerchief against his denim jacket and brimmed hat. The talk was in interview format, Costello sitting between Netsky and Boston Globe media critic Sarah Rodman, who delivered most of the questions. After some chat about the coincidence of Rodman’s and Costello’s birthday (he quipped that he knew astrology was bunk when he found his birthday shared by luminaries such as Sean Connery and Leonard Bernstein), she asked him to speak about his father, whom he has often cited as an important influence on his career. In an earnest tone, Costello recounted the musical history of his English family, starting with his father’s father, an Irishman who in World War I started a career as a band player. Costello’s father Ross McManus started as a jazz-band trumpeter and vocalist. He met his wife Lilian in the late 1940s at the record shop where she worked, searching out the American modern-jazz recordings that were scarce in England at the time. Costello’s father worked with the established Joe Loss Orchestra, and at Loss’s suggestion he dropped trumpet to became a successful vocalist in the 1950s. Their son Declan McManus, born in London in 1954, grew up listening to his father’s practicing and his parents’ records of popular vocalists like Frank Sinatra and Peggy Lee, jazz artists including Charlie Parker and Dizzy Gillespie, and classical and folk music. In the 1960s, his father struck off on a solo career as a singer of contemporary pop and rock songs as well as jazz standards, performing in northern England while his he lived with his mother in her home city, Liverpool. Costello asserted that it was natural that his musical parents did not direct him toward musical study, which he pursued on his own. As a teenager, he sang and played guitar in small folk and rock bands. After finishing secondary school in 1972, he moved back to London to pursue a career as singer and song writer, using the name Elvis Costello. He stressed that while he had been inspired and fascinated by his father’s career as a band singer and solo performer, he had also been exposed to its challenges and had no illusions about the musician’s life. Costello was not surprised or overwhelmed by the conditions of his first few years, in which he worked at non-musical jobs, performed at small venues with a variety of bands, and had his demo tapes ignored by record companies. The reset of the questions centered on selected songs, with a minute or so of the song played for the audience. Rodman first asked for Costello’s thoughts on “Watching the Detectives” from his first album My Aim is True of 1977. “I wrote that in my bedroom,” he reminisced. He had just gotten a new Telecaster guitar, which was a challenge to play. He had recorded a few singles and had recorded the album shortly before with musicians assembled from a San Francisco band, with whom he’d had some trouble communicating his ideas. He wanted to re-record it with musicians to whom he could “delegate” each musical role. He described “auditioning” a number of players for each “chair” (he laughingly pointed out how using terms like “chair” showed he really belonged at a conservatory). He was delighted with the resulting band, named the Attractions, which was an integral part of his act for many years. He hired seasoned players for the bass and drums chairs, Bruce Thomas and Pete Thomas. For the piano chair, he hired the young student Steve Nason, who adopted the stage name Costello suggested, Steve Nieve (pronounced “naive”). Costello effused about Nieve’s technical and creative skills and ability to make the keyboard part sound like Bernard Herrmann (film score composer). At the time, Costello couldn’t read music notation, and he said there was no need for scores, as rock requires only “hand signals and threats.” He also praised the well-known bassist Nick Lowe, who played on My Aim is True and continued to collaborate with Costello occasionally over the years. Rodman asked Costello to talk about “Accidents Will Happen” recorded at Hollywood High School in 1978, later on the 1979 album Armed Forces. He laughingly recalled being disappointed that the teenage audience didn’t scream more in a “proper Monkees style.” Costello remarked on the prominent baroque-influenced piano part, saying he hadn’t appreciated it enough at the time. He again praised Steve’s Nieve’s abilities and mentioned that Nieve had just brought out an album of duets with a number of renowned artists. Considering “Alison,” from My Aim is True, Rodman observed that a number of acquaintances had used it as wedding music, and she wondered whether Costello found that ironic for a song about betrayal and loss in love. Costello agreed wryly, “It does seem an odd choice.” He brought up that he was influenced by pop/R&B singer Smokey Robinson and that he stole a lick from the song “Ghetto Child.” Revisiting his reaction to the musicians on that album, he said that among those still living, John McFee impressed him. He recalled that “Alison” was originally released as a single that “bombed” in the U.K. and the U.S., but when Linda Ronstadt recorded the song, she had a hit. He admitted that while his first reaction to Ronstadt’s cover was not positive, he grew to appreciate it for its own merits and to realize that he’d joined a sort of club of artists who “create repertory” for other performers. Alison Kraus was the singer on “Scarlet Tide,” which Costello said he wrote for her performance for the 2003 movie Cold Mountain, set during the American Civil War. He gleefully exclaimed, “It’s like 800 hymns!” He explained that because he was brought up Catholic, he hadn’t been exposed much to hymns and therefore found them an interesting new musical source. “God Give Me Strength” brought an appreciative reaction from Rodman and the audience. The lush but cool orchestration in 3/4 time that undergirds Costello’s impassioned singing indicates his co-writer, Burt Bacharach. Costello said that the 1996 song was his first collaboration with Bacharach. Costello said that in 1960s England, Bacharach’s songs “dominated” the pop music heard, and he had grown up admiring them. He first met Bacharach while he was recording his own song “Satellite,” which he said borrowed some Bacharach compositional devices such as suspensions. Bacharach himself happened to be in the next studio and, at Costello’s request, generously offered some helpful suggestions. Costello was delighted with the opportunity to work with Bacharach on their 1998 album Painted from Memory, even though much of their collaboration had to be handled by fax. Costello stressed his ongoing relationship with Bacharach, including an upcoming Broadway musical based on the songs of Painted from Memory. Hearing the 1989 song “Veronica,” Costello deadpanned that the sound reminded him of Alvin and the Chipmunks. Co-written with Paul McCartney, “Veronica” was released as a single soon before appearing on Costello’s 1989 album Spike. As a Beatles fan since childhood and a fellow Liverpudlian for part of his life, Costello said he felt somewhat awed when he started working with McCartney but was soon put at ease. Costello praised the album’s producer George Martin, who was already established in British popular music when he produced the Beatles albums Revolver and Sergeant Pepper’s Lonely Hearts Club Band. He liked Martin’s personal involvement in creating the recorded music, bringing in sounds from his past, from the 1920s to the present. Without saying that he was directly influenced by the Beatles, Costello said that he noticed some characteristics shared by singers from Liverpool, such as a nasal singing style. A string quartet opened the song “Jacksons, Monk and Rowe” from the 1993 album The Juliet Letters, a collaboration between Costello and the Brodsky Quartet. Costello had long enjoyed attending concerts by the quartet, and when he met them he found that, in turn, they had been enjoying his performances. They decided to share the creation of lyrics and some music for the songs, fashioned on imaginary letters sent to the Juliet character of Shakespeare’s play. The selection played was written by the quartet’s violist Michael Thomas (not Pete Thomas, Costello cautioned). He stressed that songwriters should listen to all the music they can, and he recalled that while he was starting out in 1970s London, he went to every concert he could attend, in many genres including rock, jazz, and classical, such as the Brodsky quartet. He also remembered with satisfaction that at the time of The Juliet Letters, he had learned to read music fairly recently, and yet he wrote out all the scores himself, not knowing the composition process well enough to hire a copyist. Costello contended that he was fortunate to be involved in the unique project at that time, when it was much easier to find financial support for such an undertaking than it is now. Diana Krall was the singer and pianist on the slow and pensive “Abandoned Masquerade,” from her album “The Girl in the Other Room,” released in 2004, the year after she and Costello were married. He said, “She didn’t write often,” but with his encouragement she wrote this song to express her feelings about the death of her mother. Costello left no doubt of his devotion to his wife. The last song discussed was “Stick Out Your Tongue” from Costello’s latest album (September 2013) Wise Up Ghost, on which his band is the Roots, the long-standing alternative rap group led by drummer ?uestlove. Costello met the Roots and discussed working together, while he was an occasional guest on the Jimmy Fallon TV show, for which the Roots were the regular band. In writing the songs for the album, he took old songs he had recorded with The Attractions, and “collaged them into new narratives.” As an example, he pointed out that in composing “Tripwire” he took a four-chord progression from his earlier song “Satellite.” He defended his “collage” approach as a serious artistic technique of developing a new work by creating a true synthesis. The final question sought his advice to young people trying to “make it” in the current musical world. He advised them to decide which is their primary motivation ̶ to make music or to be famous. Despite his own eventual success, he dismissed the idea of a musical career as a route to fame and fortune. If making music is your motivation, he directed, be ready to “stick with it” through a lot of disappointments. He said flatly that he would not be able to achieve the success he has if he were starting out today, because the conditions are tougher now. Recounting the history of sound recording from wax cylinders through compact discs, today, he contended, the mp3 file is thwarting the aspirations of musicians who want to create a physical object a listener can love, as a reader loves a book. Constrained by time, Costello wrapped up his intense discussion and warmly accepted the audience’s ovation."